The plan for the development of the San Francisco Bay Trail calls for a continuous 500-mile network of bicycling and hiking trails that will encircle San Francisco Bay, San Pablo Bay and the Carquinez Strait. When completed, the trail will run through all nine Bay Area counties, connecting cities and towns with the shoreline and with each other. The San Francisco Bay Trail is a project of MTC and the Association of Bay Area Governments. Over 350 miles have already been developed! The trail now touches all nine Bay Area counties, passes through 47 cities and crosses four-and-a half toll bridges. 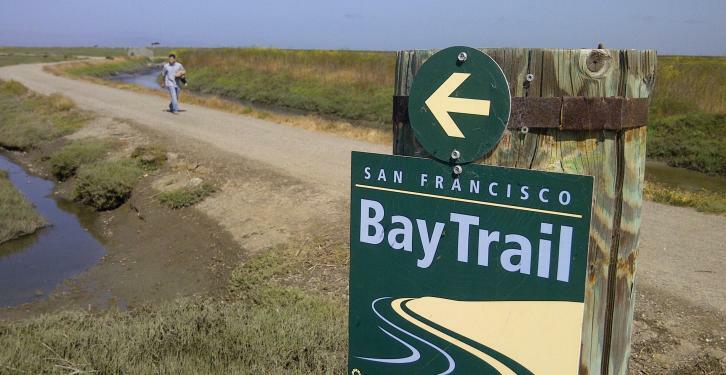 Hikers, joggers, bicyclists, skaters and wheelchair riders can all enjoy the Bay Trail. The opportunities for wildlife viewing and environmental education are many. The Bay Trail also serves as an important commute alternative for bicyclists. Learn more about the Bay Trail when you visit the website. Who Heads Up the Bay Trail? The San Francisco Bay Water Trail is a growing network of designated launching and landing sites, or “trailheads,” around San Francisco Bay. Each trailhead enables non-motorized small boat users to enjoy the historic, scenic, cultural and environmental richness of San Francisco Bay and its nearby tributary waters. The Water Trail promotes safe and responsible use of the Bay while protecting and increasing appreciation of its environmental resources through education and strategic planning. The Water Trail’s network of sites encourages people to explore the Bay in different boat types (such as kayaks, sailboards, dragon boats, and stand up paddleboards) and in a variety of settings through single- and multi-day trips. Potentially, more than 100 existing marinas, waterfront parks, and other publicly accessible sites will become part of the Water Trail. Learn more about the Water Trail via its website: http://sfbaywatertrail.org/. The Bay Trail originally was envisioned as a “ring around the bay” by then-state Sen. Bill Lockyer, whose Senate Bill 100 was passed into law in 1987. The Bay Trail connects to numerous transit facilities, including ferry terminals, light-rail lines, bus stops, and Caltrain, Amtrak and BART stations. The Bay Trail eventually will cross most of the major toll bridges in the Bay Area.